The Battle of Snuol was a major battle of the Vietnam War, conducted by the Army of the Republic of Vietnam as part of Operation Toàn Thắng TT02. The battle lasted from January 5 to May 30, 1971. In 1970 the joint South Vietnamese and U.S Cambodian Incursion was viewed as an overall success after allied troops successfully captured a huge enemy cache consisting of food and weapon supplies. Although relatively little contact was made during the operation, the Viet Cong and North Vietnamese troops were forced to move deeper into Cambodian territory. 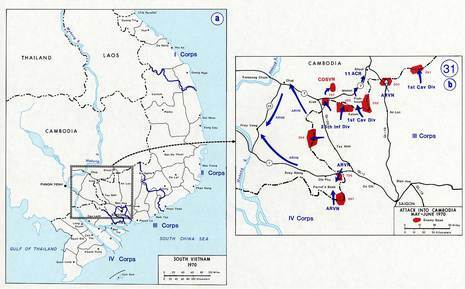 One year following the incursion, General Nguyen Van Hieu and General Do Cao Tri made a plan to go back inside Cambodian territory to find and destroy the Viet Cong. According to General Hieu's plan, instead of searching for the enemy the ARVN would use one regiment and try luring out and trap the Viet Cong once they come out to attack. South Vietnamese commanders called this the "luring the tiger down the mountain tactic". In order to carry out their mission, South Vietnam was ready to commit the ARVN 5th Division, as well as the 18th and 25th Divisions just in case if the Viet Cong would come out in force. Đỗ Cao Trí 20 November 1929 - 23 February 1971 was a general in the Army of the Republic of Vietnam (ARVN). He was born in Binh Tuoc, Bien Hoa, French Indochina. Tri earned his Baccalaureate Part II from Petrus Ky High School in Saigon. After entering the French colonial forces in 1947, he graduated from Do Huu Vi Officer Class and the following year was sent to Auvour, France to attend the infantry school. In 1953, he graduated from General Staff and Command Class in Hanoi. In 1958 he attended the United States Command and General Staff College at Fort Leavenworth, Kansas. During the same year he graduated from Air-Ground Operations School at Fort Kisler, in Washington state. Tri was considered by both his contemporaries and by historians as one of the most aggressive and able combat commanders produced by the Republic of Vietnam. As a lieutenant general, he performed brilliantly as commander of the III Corps Tactical Zone during the Cambodian Campaign of 1970, earning an unusual laudatory sobriquet from the U.S. news media as "the Patton of the Parrot's Beak". 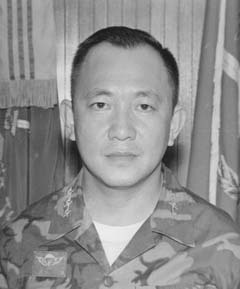 Tri had been ordered north to take command of beleaguered I Corps Tactical Zone forces after Operation Lam Son 719 by General Hoang Xuan Lam began to falter, when he was killed in a helicopter accident while still in Cambodia.